Dont let the sleek, understated exterior fool you. The P9 Window is loaded with builder-focused features that deliver performance, Quiet Computing, and future-proof expandability right out of the box. The interior volume, the variety of cooling options, and the modular HDD cages are just a few of the features that make the P9 Window stand out in the Performance One series. The P9 Window mid-tower gaming case has the space to house your high-end components--and cool them quietly. Eight tool-less 3.5 drive bays are each compatible with 2.5 SSD, and weve included two dedicated SSD mounts behind the motherboard for ultimate expandability. The modular HDD cages can be removed to accommodate graphics cards up to 16.9/ 430 mm, while noise-dampening side and top panels make sure that only your systems performance speaks for itself. Both top and bottom drive cages can be removed to make space for a reservoir for your custom liquid cooling setup, and the included pump bracket and adjustable mount make it easy for you to position your liquid coolers just about wherever you want to. Mounting points for a 240 mm in the front and up to a 240/280 mm radiator on top mean youre ready to take charge of your cooling system. Keeping your components dust free is key to a long lasting system. Washable air filters for front intake fans, the PSU compartment, and the bottom of the chassis slide out for easy access. Focus more on your game and less on cable management. 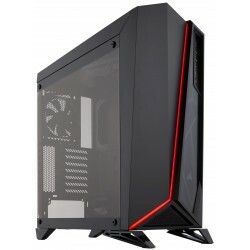 The included stealth cable ties, cable routing holes, and ample space behind the motherboard result in a clean, powerful build that youll be proud to show off through the windowed side panel. Top power/reset buttons conveniently located on the top panel give you full control of your system. Use the two fan control switches to toggle between silence and performance with ease, while the two USB 3.0 ports give fast data transfer speeds up to 5 gbps.